Frank Goss seems to have written his memoir as a reflection of his childhood. He makes no references to his adult life and focuses solely on his childhood up until he leaves school at age fourteen. He makes references to today’s children not having as much freedom as he did as he recounts the hours he spent away from home with his brothers. The tone in the memoir is professional but lively as he goes into great detail when describing certain parts of his childhood. This suggests that he wanted his memoir to be read publicly. Also, when his grandmother dies he seems disappointed that there will be no one to remember that she ever existed other than their family. He writes “Nothing remained to tell the whole world that she had ever lived but a few, old letters, her Astrakhan coat, her elastic-sided boots, and her string bag. No message, no complaint.” (p150). Goss may have written his memoir because he wanted his life and his family to be remembered. Also, he may have wanted something important to be left behind to show that he existed as possessions can be sold on or donated. The lively tone suggests that he also wanted to amuse his readers and it adds excitement to his memoir. It makes his memoir more interesting as you can tell that Goss enjoys recounting his adventures. Whilst Goss does not explicitly state the purpose and audience in his memoir, it can be interpreted that he wanted his memoir to be read publicly due to the style of writing and formal tone. He also paints a vivid picture of the housing in London when his family were in a state of poverty. Goss describes how thousands of houses were built exactly alike and the front of the house had a “low stone-coped wall supporting a wrought iron fence and gate” which “prevented pedestrians from falling into the basement area” (p32). He goes on to say that “sometimes three or even four families were thereby housed on each floor with the poorest in the basement” (p32). This suggests that he could also be writing for people who have an interest in working class life and the housing different classes lived in. 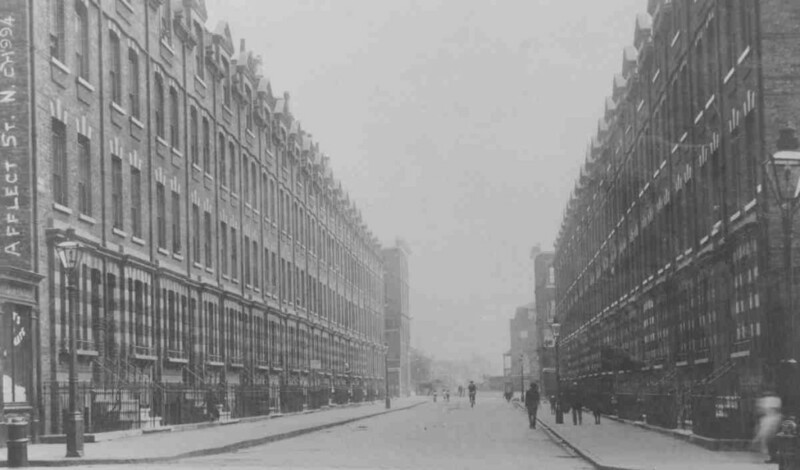 Working class housing, London, 1900. It is not clear when he started writing his memoir or how long it took him to write it but at the end of this memoir he says that fifty years have passed since. Nan Hackett states that all working-class autobiographies had a purpose, and it “was to document a way of life” (p209). This could be said for Goss as he is documenting his childhood, focusing on his family, his home and his education. I find it interesting how Goss chose to write about his childhood and even though he was writing it when he was an adult, he decided not to write about that part of his life. He also chose not to write about the war and only briefly mentions it in a sentence at the end of his memoir. This could possibly be because many people were writing about their life during the war and the affect it had on them. He might have wanted his memoir to be different and growing up at the end of the nineteenth century was also a crucial time. The title ‘My Boyhood At the Turn of the Century’ also makes the memoir stand out which could have been the affect he was hoping for.